Choose from hundreds of styles! All draperies are custom-made right here in our St. Louis workroom. Browse our drapery galleries now for ideas! It’s Spring time! We have tons of new specials going on this month here at Sunshine Drapery including a new Hunter Douglas rebate! Come see our huge selection of window coverings in Chesterfield or Sunset Hills and speak with a designer to find that perfect fit. 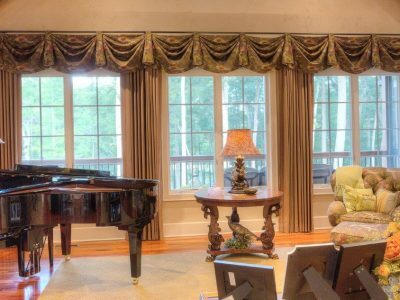 Since 1969, Sunshine Drapery & Interior Design has helped homeowners and businesses throughout the St Louis area with their custom window covering and design needs. Over the years, we’ve seen lots of changes in style, color trends and product innovations, and our talented designers keep up with the latest designs. Yet, our mission has remained steadfast: to provide the highest level of customer service with outstanding product. At Sunshine Drapery & Interior Design our experienced designers travel to your home or business. They see the windows, the room and surroundings and, of course, understand your design style to find the right window treatment for you. This personalized service is complimentary and is just one of the ways we strive to provide high-quality service. Our designers bring an assortment of fabrics as well as blind, shade and shutter samples. They also use an iPad to show our work and variety of styles and to help you visualize a look. We work hard to ensure our showrooms and website highlight the latest designs and products. Our experienced professionals make all draperies, soft valances, cornices and every style possible in our 25,000 square-foot workroom in Maryland Heights, Missouri. And our in-house expert installers hang your window treatments with the utmost care. We make scheduling your appointment as convenient as possible: Call 314-334-1720, click or visit our beautiful showrooms in Chesterfield or Sunset Hills. Whether you have one window or many, our Sunshine team will work to ensure your experience and window treatments are what you deserve – the best!